#2016, 16″ long strap Embossed Over The Seal Steel Hinges- 8 gauge strap hinge available zinc plated or stainless steel. 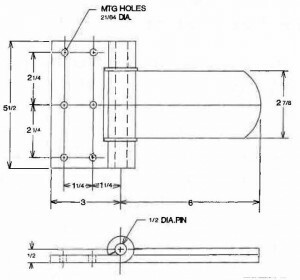 1/2″ pin, mounting holes for 5/16″ bolts. Can bridge the door molding or door seal. 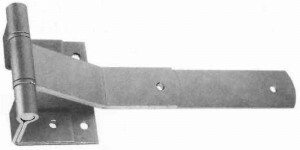 Narrow Bracket Over The Seal Steel Hinges- 8 gauge strap hinge available zinc plated or stainless steel, .160 aluminum & 10 gauge stainless steel. 1/2″ pin. Can bridge the door molding or door seal. 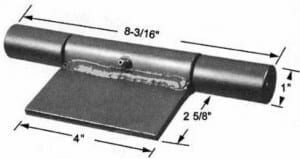 3400 Series Narrow Bracket Side & Rear Door Hinges – 8 gauge strap hinge with 180 degree swing. Available zinc plated or stainless steel. Embossed strap. 1/2″ pin. Can bridge the door molding or door seal. 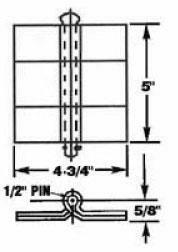 #3416, 16″ long strap 3500 Series Narrow Bracket Over The Seal Steel Hinges- 8 gauge strap hinge available zinc plated or stainless steel. Embossed strap. 1/2″ pin. Can bridge the door molding or door seal. 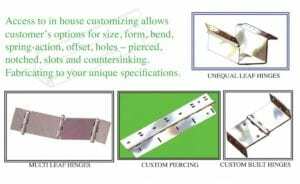 #1806-004-B –4 Holes Square Corner Hinge- 8 gauge strap hinge with 270 degree swing. Zinc plated steel. 1/2″ pin. Universal for right and left hand doors. 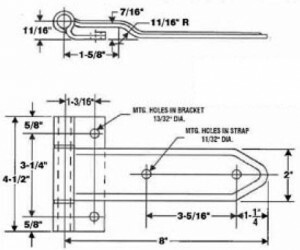 1/2″ offset available. Heavy Duty Laminated Steel Hinge- Hinge with 270 degree swing. Plain steel. 1/2″ pin. 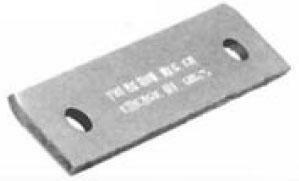 Strap 1/2″ (2 lamination of 1/4″ steel) x 2-7/8″ x 4″ Ramp Door Hinge Plain finish, steel weld-on hinge with grease fitting. 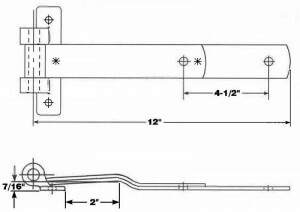 8-3/16″ overall length, 1/4″ leaf with 1/4″ offset, brackets 1.05 O.D. 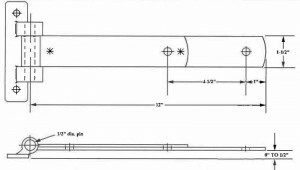 2″ long bushings. Manufactured from high quality steel. Embossed for greater strength. For use on trailers and truck bodies. Has wide bracket with three mounting holes. Three strap lengths available. Hinges supplied with non-removable pin for maximum security. Also available with removable pins. To order removable pins add the letter R to the catalog number. Example: 2008-R.
Also available in 0.160 aluminum & 10 ga. plain or polished stainless steel. 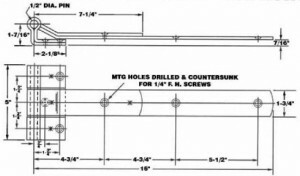 For use with 2000 series hinges with wide bracket when 1/8” offset is required. Designed to bridge door molding or door seal. Manufactured from high quality steel. Embossed for greater strength. Three strap lengths available. All hinges supplied with non-removable pin for maximum security. Also available with removable pins. 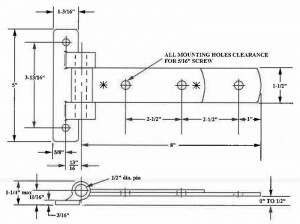 To order removable pins add the letter R to the catalog number Example: 2108-R.
All mounting holes for 5/16″ bolts. Also available in 0.160 aluminum & 10 ga. plain and polished stainless steel. Reverse bracket allows door to swing 270 degrees. Manufactured from high quality steel, embossed for greater strength. All hinges supplied with non-removable pin. Also available with removable pins. To order removable pins add the letter R to the catalog number. Example: 2208-R.
Strap – 8 Ga. x 2″ x 8″, 12″ or 16″. Finish – Steel – Zinc Plated. 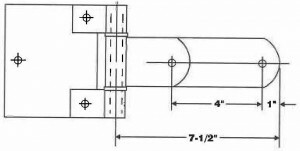 For use with all 2000 series hinges with a narrow bracket when 1/8” offset is required. Manufactured from high quality steel. Strap is embossed for greater strength. 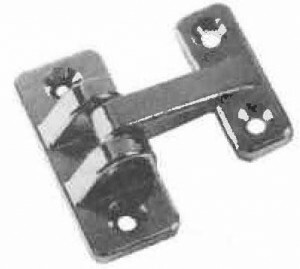 Basic hinge as 2000 Series but features a narrow bracket for mounting where space is limited. Designed to bridge door molding or door seal. Manufactured from high quality steel. Strap is embossed for greater strength. Features a narrow bracket for mounting where space is limited. Supplied with non-removable pin for maximum security. Also available with removable pin. To order removable pin add the letter R to the catalog number. 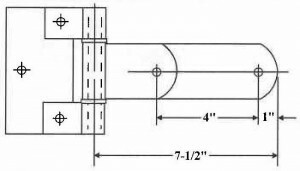 Example: 2508-R.
Design to bridge door molding or door seal. Reverse bracket enables 270 degree swing. Manufactured from high quality steel. Strap is embossed for greater strength. Single layer bracket is seam welded for maximum strength. Supplied with non-removable pin for maximum security. Economy hinge for mounting with 180 degree swing. Manufactured from high quality steel. Strap is embossed for greater strength. Single layer bracket and leaf are seam welded for maximum strength. Supplied with non-removable pin for maximum security. 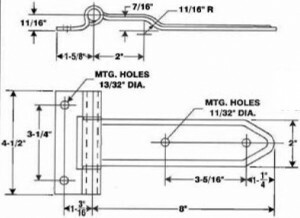 Design to bridge door molding or door seal. Manufactured from high quality steel. Strap is embossed for greater strength. Single layer bracket and leaf are seam welded for maximum strength. Supplied with non-removable pin for maximum security. 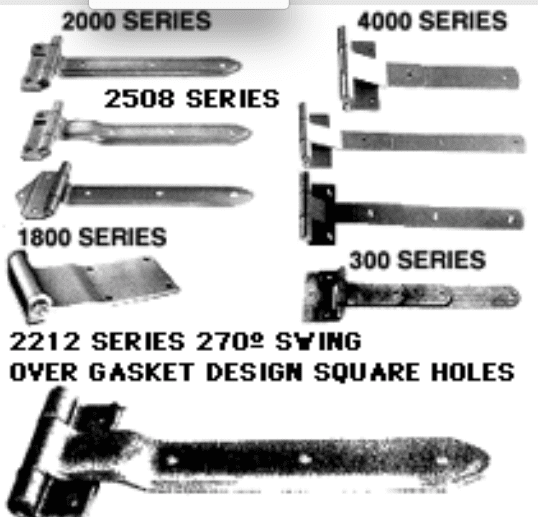 All steel hinges have double or triple laminations in the strap for greater strength. Opens 180 degrees. Supplied with non-removable pin for maximum security. (Also available with removable pin). Available flush or 3/16″ offset. Available in 10 Ga. stainless steel. 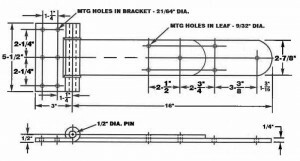 Strap – 8 Ga. x 2 1/4″ x 8″, 12″ or 16″ and 19″ long. All steel hinges have double or triple laminations for greater strength. Allows for 270 degree opening. Supplied with non-removable pin for maximum security. (Removable pin also available). Available in 10 ga stainless steel. 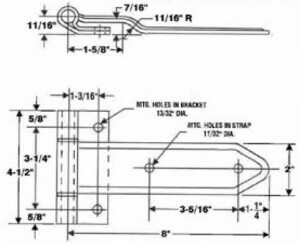 Strap – 8 Ga. x 2 1/4″ x 8″, 12″ or 16″ and 19″. All steel hinges allow full 270 º opening to enable door to swing parallel with side of body. Supplied with non-removable pin for maximum security. (Removable pin also available). Universal for right or left hand doors. Square corner rear door hinge. All steel, this hinge allows door to swing 270º for full opening. Supplied with non-removable pin. (Removable pin also available). Universal for right or left hand doors. 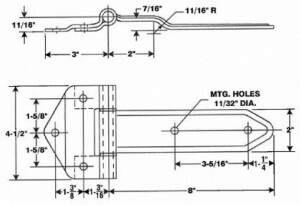 Available Flush to 1/2″ Offset. For trailer and container doors fabricated with a heavy steel bushing as a pivet point for demanding applications. Available with or without mounting holes. 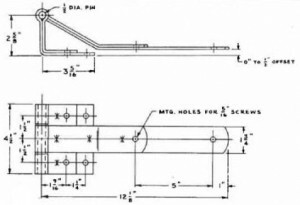 All steel construction fabricated of 1/4″ thick steel rolled to form a pivot point. 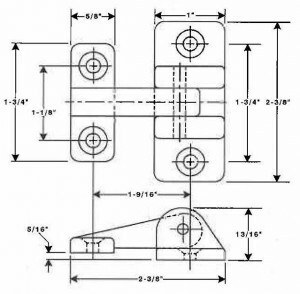 Use the same heavy 5/16″ thick steel bracket from the 1809 hinge. Available in 3.4 and no hole models with 1/2″ steel boll and lock nut. 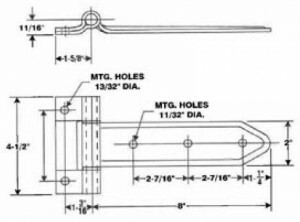 Hinge with 1 3/4″ radius for rounded corner applications has 3 laminations of 8 ga. steel for added strength. Has 270 degree swing. 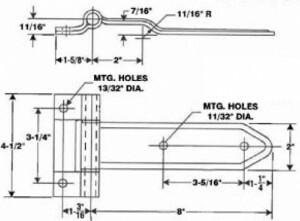 Can be supplied with a 7/16″ over the seal bend. 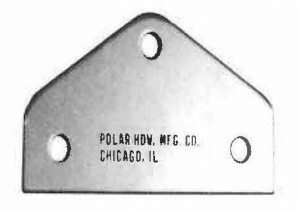 This 1″ radius corner hinge has embossed steel strap and Malleable iron bracket. Has 270 degree swing to allow full opening of rear door. Designed for square corner applications. Has a steel laminated strap for added strength. Swings 270 degrees to enable door to be opened completely. 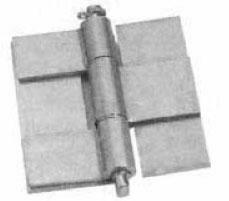 Strap – Zinc nlated 8 Pa. x 1-1/2″ x 25-1/4″ long. 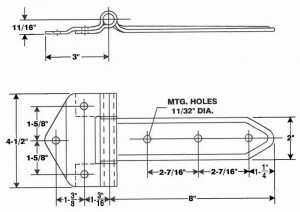 Pin – 1/2″ Dia. x 2-7/8″ long. Features narrow bracket to allow mounting without modification. Full 270º swing to allow door to open to side of body. 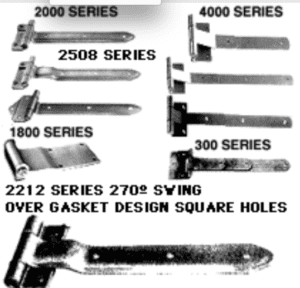 Made from 1/4″ steel for heavy duty applications. Heavy duty laminated hinge with no holes for weld on applications. Has double laminations of 1/ 4″ steel for extra strength. 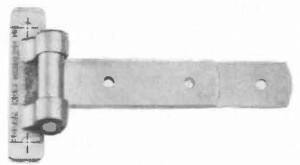 All steel hinge features narrow bracket. Short strap has double lamination. 270º rotation. Features narrow bracket for mounting where space is limited. 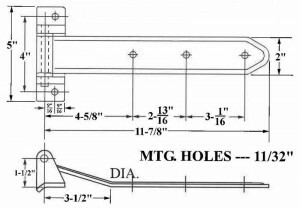 Supplied with 1/2″ drive pin. (Removable pin also available). Finish – Powder coated bracket and zinc plated leaf. Narrow bracket for mounting where space is limited. 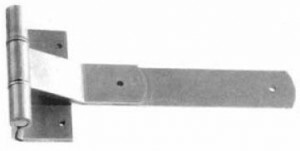 This hinge is designed with bend to accommodate Vinyl or Aluminum extrusion. 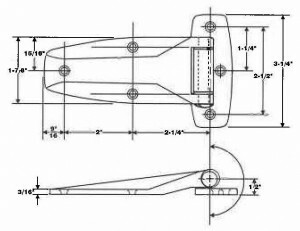 Weight – 2 1/2 lbs. 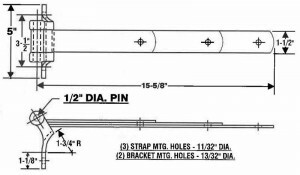 Material 3/16″ Aluminum with 1/2″ Dia. 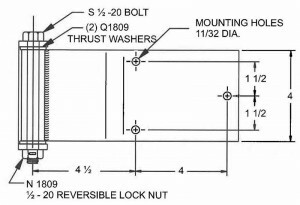 Removable Steel Pin and thrust washers. Can be welded on or end user can drill holes for mounting. Weight – 1 1/8 lbs. 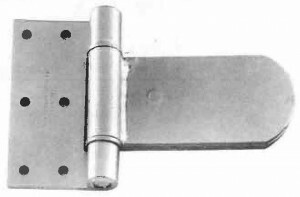 Steel hinge for ramps or heavy access doors. Plain finish for easier welding. Supplied with a grease fitting for long life & smooth operation. 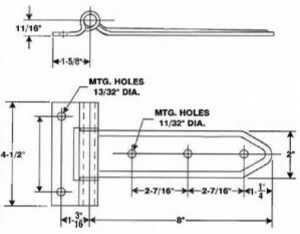 Brackets are 1.05 O. D. bushings 2″ long, leaf is 1/4″ offset and made of 1/4″ steel. 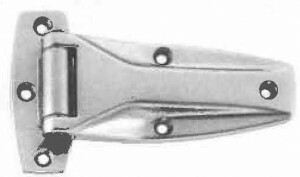 Economy die cast hinge for use on utility and service vehicles. Can also be used on access doors for recreational and emergency vehicles. Supplied with a solid stainless steel pin for strong rustfree service. Holes drilled and countersunk for No. 10 screws. Zinc die cast flush hinge. Chrome plated hinge revolves on nylon bushings for smooth operation. For use on cabinets, service vehicles and utility trucks. Has reinforced ribbing on back for added strength. Features a solid stainless steel pin. Holes drilled and countersunk for No. 10 screws. Finish – Chrome plated Weight – 0.7 lbs.